Denver Broncos safety T.J. Ward is leading a dominant defense that is oppressive to opposing quarterbacks. Josh McCown will face the ultimate heat check in Week 6. The veteran quarterback of the Cleveland Browns became the first player in franchise history to throw for 300 yards in three consecutive games when he torched the Baltimore Ravens for 457 yards in Week 5, but he’ll face a Denver Broncos defense he considers one the best he’s ever seen on Sunday. 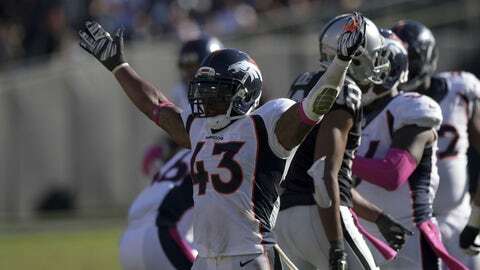 The Broncos defense currently ranks first in the NFL in yards per play (4.3), takeaways (14) and sacks (22). Only the New York Jets are giving up fewer points per game than Denver’s 15.8. Amazingly, the Broncos have allowed only seven touchdowns through five games, while also returning three takeaways for scores. There’s even more bad news for McCown: Opposing quarterbacks have a combined passer rating of just 70.8 against the Broncos. And with 22 sacks over the first five weeks, Denver is currently on pace for almost 71. The NFL record is 74, set by the 1984 Chicago Bears. McCown will welcome the Broncos to Cleveland as arguably the hottest quarterback in the NFL. Over the last three games, the 36-year-old has completed 96 of his 141 attempts for a league-high 1,154 yards, six touchdowns and one interception. His passer rating during the stretch is 104.1. Last Sunday, McCown threw for a franchise record 457 yards and was responsible for three touchdowns (one rushing) during Cleveland’s come-from-behind win in overtime against the Ravens. If any defense is capable of cooling off the Browns’ red-hot quarterback, it’s Denver’s.